In 1924, at the convincing of Boston grocery magnate Charles Adams, the National Hockey League decided to expand to the United States. Adams had come to greatly enjoy ice hockey while watching the 1924 Stanley Cup Finals between the NHL champion Montreal Canadiens and the WCHL champion Calgary Tigers. The previous year in 1923, Thomas Duggan received options on three NHL franchises for the United States, and he sold one to Charles Adams, who in turn, persuaded the NHL to grant him a franchise for the city of Boston, which occurred on November 1, 1924. With the Montreal Maroons, the team was one of the NHL's first expansion teams, and the first NHL team to be based in the United States. Adams' first act was to hire Art Ross, a former star player and innovator, as general manager. Ross was the face of the franchise for the next thirty years, including four separate stints as coach. Adams directed Ross to come up with a nickname that would portray an untamed animal displaying speed, agility, and cunning. Ross came up with "Bruins", an Old English word used for brown bears (from the Dutch "bruin" meaning brown) in classic folk tales. The team's bearlike nickname also went along with the team's original uniform colors of brown and yellow, which came from Adams' grocery chain, First National Stores. On December 1, 1924, the new Bruins team played their first NHL game against their expansion cousins the Maroons, at Boston Arena, with Canadian skater Smokey Harris scoring the first-ever Bruins goal, spurring the Bruins to a 2–1 win. This would be one of the few high points of the season, as the Bruins proved to be no match for the established NHL teams. At the time, the NHL did not conduct an expansion draft for new teams, there were few American-born hockey players and many Canadian players were initially skeptical of hockey's long-term prospects in the Eastern United States. Boston was therefore left with a team full of NHL castaways unable to land a spot on the roster of the more established Canadian teams. The Bruins only managed a 6–24–0 record (to this day, their worst points percentage – .200 – in franchise history) and finished in last place in its first season – within this timeframe, only one week later on December 8, 1924, what would become one of the NHL's all-time fiercest rivalries was initiated, as the Montreal Canadiens were the visiting team at the Boston Arena that night, defeating the hometown Bruins by a 4–3 score. The Bruins played three more seasons at the Arena, after which they became the main tenant of the famous Boston Garden, while the old Boston Arena facility – the world's oldest existing indoor ice hockey venue still used for the sport at any level of competition, and the only surviving rink where an Original Six NHL team began their career in the league – was eventually taken over by Northeastern University, and renamed Matthews Arena when the university renovated it in 1979. The Bruins' managed to improve in their second season to a winning record, largely due to the presence of two more expansion teams. Unfortunately for Boston, the NHL did not expand the playoffs for the 1925–26 season and the Bruins missed out on the third and final playoff berth by one point to the expansion Pittsburgh Pirates. In their third season, 1926–27, the organization made some wise personnel moves. Ross took advantage of the collapse of the Western Hockey League to purchase several western stars, including the team's first great star, a defenseman from Fort Qu'Appelle, Saskatchewan named Eddie Shore. The Bruins' moves were largely counterbalanced by WHL player acquisitions on other NHL teams, and the team's record was actually slightly worse than the previous season (the Bruins finished only one game above .500), but Boston nevertheless qualified for the then-expanded playoffs by a comfortable margin. In their first-ever playoff run, the Bruins reached the Stanley Cup Final where they lost to the Ottawa Senators in the first Cup Final to be between exclusively NHL teams. In 1929 the Bruins defeated the New York Rangers to win their first Stanley Cup. Standout players on the first championship team included Shore, Harry Oliver, Dit Clapper, Dutch Gainor and goaltender Tiny Thompson. The 1928–29 season was the first played at Boston Garden, which Adams had built after guaranteeing his backers $500,000 in gate receipts over the next five years. The season after that, 1929–30, the Bruins posted the best-ever regular season winning percentage in the NHL (an astonishing .875, winning 38 out of 44 games, a record which still stands) and shattered numerous team scoring records, but lost to the Montreal Canadiens in the Cup Final. The 1930s Bruins teams included Shore, Thompson, Clapper, Babe Siebert and Cooney Weiland. The team led the league's standings five times in the decade. In 1939, the team changed its uniform colors from brown and yellow to the current black and gold, and captured the second Stanley Cup in franchise history. That year, Thompson was traded for rookie goaltender Frank Brimsek. Brimsek had an award-winning season, capturing the Vezina and Calder Trophies, becoming the first rookie named to the NHL First All-Star Team, and earning the nickname "Mr. Zero." The team skating in front of Brimsek included Bill Cowley, Shore, Clapper and "Sudden Death" Mel Hill (who scored three overtime goals in one playoff series), together with the "Kraut Line" of center Milt Schmidt, right winger Bobby Bauer and left winger Woody Dumart. In 1940 Shore was traded to the struggling New York Americans for his final NHL season. In 1941 the Bruins won their third Stanley Cup after losing only eight games and finishing first in the regular season. It was their last Stanley Cup for 29 years. World War II affected the Bruins more than most teams; Brimsek and the "Krauts" all enlisted after the 1940–41 Cup win, and lost the most productive years of their careers at war. Cowley, assisted by veteran player Clapper and Busher Jackson, was the team's remaining star. Even though the NHL had by 1942 been reduced to the six teams that would in the modern era be called the "Original Six", talent was depleted enough that freak seasons could take place, as in 1944, when Bruin Herb Cain would set the then-NHL record for points in a season with 82. But the Bruins did not make the playoffs that season, and Cain was out of the NHL two seasons later. The stars returned for the 1945–46 season, and Clapper led the team back to the Stanley Cup Final as player-coach. He retired as a player after the next season, becoming the first player to play twenty NHL seasons, but stayed on as coach for two more years. Brimsek proved to be not as good as he was before the war, and after 1946 the Bruins lost in the first playoff round three straight years, resulting in Clapper's resignation. Brimsek was traded to the last-place Chicago Black Hawks in 1949, followed by the unexpected lifetime ban of promising young star Don Gallinger on suspicion of gambling. The only remaining quality young player who stayed with the team for any length was forward Johnny Peirson, recognizable to fans of a later era as the Bruins' television color commentator in the 1970s. During the 1948–49 season, the original form of the "spoked-B" logo, with a small number "24" to the left of the capital B signifying the calendar year in the 20th century in which the Bruins team first played, and a similarly small "49" to the right of the "B", for the then-current season's calendar year in the 20th century, appeared on their home uniforms—a nod to the Boston area's nickname of "The Hub". 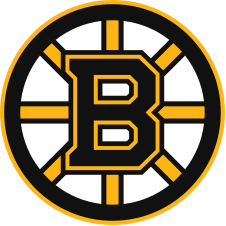 The following season, the logo was modified into the basic "spoked-B" form that was to be used, virtually unchanged (except for certain proportions within the logo), through the 1993–94 season. In 1954, on New Year's Day, Robert Skrak, an assistant to Frank Zamboni, the inventor of the best known ice resurfacing machine of the time, demonstrated a very early model of the machine at Boston Garden to the team management, and as a result, the Bruins ordered one of the then-produced "Model E" resurfacers to be used at the Garden, the first known NHL team to acquire one of the soon-to-be-ubiquitous "Zambonis" for their own use. The Bruins' Zamboni Model E, factory serial number 21—used as late as the 1980s on an emergency basis—eventually ended up in the Hockey Hall of Fame in Toronto in 1988 for preservation. On January 18, 1958, a milestone in NHL history occurred as the first black person ever to play in the NHL stepped onto the ice for the Bruins, New Brunswick-born left wing Willie O'Ree. He played in 45 games for the Bruins over the 1957–58 and 1960–61 seasons, scoring six goals and ten assists in his NHL career. During this period, the farm system of the Bruins was not as expansive or well-developed as most of the other five teams. The Bruins sought players not protected by the other teams, and in like fashion to the aforementioned signing of Willie O'Ree, the team signed Tommy Williams from the 1960 Olympic-gold medal winning American national men's hockey team—at the time the only American player in the NHL—in 1962. The "Uke Line"—named for the Ukrainian heritage of Johnny Bucyk, Vic Stasiuk and Bronco Horvath – came to Boston in 1957 and enjoyed four productive offensive seasons, heralding, along with scoring stalwarts Don McKenney and Fleming MacKell, the successful era of the late 1950s. There followed a long and difficult reconstruction period in the early, mid-1960s. "Our fans had heard about this kid for a few years now. There was a lot of pressure on him, but he met all the expectations. He was a star from the moment they played the national anthem in the opening game of the season." Despite Orr's stellar rookie season, the Bruins would miss the playoffs. The next season, they would go on to make the playoffs for 29 straight seasons. The Bruins then obtained young forwards Phil Esposito, Ken Hodge and Fred Stanfield from Chicago in a deal celebrated as one of the most one-sided in hockey history. Hodge and Stanfield became key elements of the Bruins' success, and Esposito, who centered a line with Hodge and Wayne Cashman, became the league's top goal-scorer and the first NHL player to break the 100-point mark, setting many goal- and point-scoring records. Esposito remains one of four players to win the Art Ross Trophy four consecutive seasons (the other three are Jaromir Jagr, Wayne Gretzky and Gordie Howe). With other stars like forwards Bucyk, John McKenzie, Derek Sanderson, and Hodge, steady defenders like Dallas Smith and goaltender Gerry Cheevers, the "Big Bad Bruins" became one of the league's top teams from the late 1960s into the 1980s. In 1970, a 29-year Stanley Cup drought came to an end in Boston, as the Bruins defeated the St. Louis Blues in four games in the Final. Orr scored the game-winning goal in overtime to clinch the Stanley Cup. The same season was Orr's most awarded—the third of eight consecutive years he won the James Norris Memorial Trophy as the top defenseman in the NHL—and he won the Art Ross Trophy, the Conn Smythe Trophy and the Hart Memorial Trophy, the only player to ever win four major awards in the same season. "No one, absolutely no one, could have finished a goal in like manner. For years Orr had been described as someone who was graceful, elegant, powerful, without fear—poetry in motion. All these epithets were captured and immortalized in the photos of the goal that won the 1970 Stanley Cup." The 1970–71 season was, in retrospect, the high-water mark of the 1970s for Boston. While Sinden temporarily retired from hockey to enter business (he was replaced by ex-Bruin and Canadien defenseman Tom Johnson), the Bruins set dozens of offensive scoring records: they had seven of the league's top ten scorers—a feat not achieved before or since—set the record for wins in a season, and in a league that had never seen a 100-point scorer before 1969, the Bruins had four that year. All four (Orr, Esposito, Bucyk and Hodge) were named First Team All-Stars, a feat matched in the expansion era only by the 1976–77 Canadiens. Boston were favored to repeat as Cup champions, but ran into a roadblock in the playoffs. Up 5–1 at one point in game two of the quarter-finals against the Canadiens (and rookie goaltender Ken Dryden), the Bruins squandered the lead to lose 7–5. The Bruins never recovered and lost the series in seven games. While the Bruins were not quite as dominant the next season (although only three points behind the 1971 pace), Esposito and Orr were once again one-two in the scoring standings (followed by Bucyk in ninth place) and they regained the Stanley Cup by defeating the New York Rangers in six games in the Finals. Rangers blueliner Brad Park, who came runner-up to Orr's (then) five-year monopoly on the Norris Trophy, said, "Bobby Orr was—didn't make—the difference." The 1972–73 season saw upheaval at the Bruins. Former head coach Sinden became the general manager. Bruins players Gerry Cheevers, Derek Sanderson and Johnny McKenzie left to join the upstart World Hockey Association. Coach Tom Johnson was fired 52 games into the season, replaced by Bep Guidolin, who had once coached Orr. The Adams family, which had owned the team since its founding in the 1920s, sold it to Storer Broadcasting. The Bruins' season came to a premature end in a first-round loss to the Rangers in the 1973 playoffs, losing Esposito to injury in that first round. In 1974, the Bruins regained their first place standing in the regular season, with three 100-point scorers on the team (Esposito, Orr, and Hodge). However they lost the 1974 Final in an upset to the Philadelphia Flyers. Terry O'Reilly was drafted by the Bruins 14th overall in the 1971 draft. He played his entire career with the Bruins from 1971 to 1985. Don Cherry stepped behind the bench as the new coach in 1974–75. The Bruins stocked themselves with enforcers and grinders, and remained competitive under Cherry's reign, the so-called "Lunch Pail A.C"., behind players such as Gregg Sheppard, Terry O'Reilly, Stan Jonathan, and Peter McNab. This would also turn out to be Orr's final full season in the league, before his knee injuries worsened, as well as the last time Orr and Esposito would finish 1–2 in regular season scoring. The Bruins placed second in the Adams Division, and lost to the Chicago Black Hawks in the first round of the 1975 playoffs, losing a best-of-three series, two games to one. Continuing with Cherry's rebuilding of the team, the Bruins traded Esposito and Carol Vadnais for Brad Park, Jean Ratelle and Joe Zanussi to the Rangers. That trade was particularly controversial for both Bruins and Rangers fans, as Esposito was one of the most popular Bruins players (though it was known he disagreed with Cherry's coaching), while Park and Ratelle were Rangers stalwarts. However, Boston ended up getting the better of the trade, as Esposito never reached his previous scoring highs with the Rangers, while Ratelle maintained his skill level with the Bruins and was a high scorer for several years more. Particularly, it was Park who reemerged as one of the league's best defencemen and filled the void left by Orr, who had been sidelined by surgery at the start of 1975–76 and only managed to play ten games before being injured and lost for the rest of the season. The Bruins made the semi-finals again, losing to the Flyers. As an impending free agent, contract talks with Orr and his agent Alan Eagleson had been tumultuous throughout 1975–76. Although insurers would not underwrite Orr and doctors advised he could not play much longer, the Bruins still attempted to re-sign Orr and offered him a five-year deal at US$925,000, or 18.6 percent ownership of the club in 1980. However, Eagleson turned down the offer without informing Orr, instead signing him to the Chicago Black Hawks in 1976; Orr was never effective – having only played 26 games in Chicago – and retired after many knee operations in 1979. Cheevers returned from the WHA in 1977, and the Bruins got past the Flyers in the semi-finals, but they were swept by the Canadiens in the Stanley Cup Finals. The story repeated itself in 1978—with a balanced attack that saw Boston have eleven players with 20+ goal seasons, still the NHL record—as the Bruins made the Final once more, but lost in six games to the Canadiens team that had recorded the best regular season in modern history. After that series, Johnny Bucyk retired, holding virtually every Bruins' career longevity and scoring mark to that time. The 1979 semi-final series against the Habs proved to be Cherry's undoing. In the deciding seventh game, the Bruins, up by a goal, were called for having too many men on the ice in the late stages of the third period. Montreal tied the game on the ensuing power play and won in overtime. Never popular with Harry Sinden, by then the Bruins' general manager, Cherry was dismissed as head coach but was later hired in the same capacity with the Colorado Rockies. At Madison Square Garden on December 23, 1979, just after the Bruins beat the New York Rangers 4–3, John Kaptain, a Rangers fan from New Jersey, stole Stan Jonathan's stick and hit him with it during a post-game scrum. When other fans got involved, Terry O'Reilly charged into the stands followed by his teammates. During the fight, Bruin defenseman and future NBC hockey analyst Mike Milbury famously pulled off Kaptain's shoe and hit him with it. O'Reilly, a future team captain, received an eight-game suspension for the brawl, while Milbury and McNab were suspended for six games and the entire team save for Cheevers was fined $500, while Kaptain was sentenced to six months in prison. In 2012, TSN named the fight, entitled "Milbury and The Shoe", as No. 4 on its Top 10 Craziest Hockey Moments. The 1979 season saw new Head Coach Fred Creighton—himself replaced by the newly retired Cheevers the following year. The Bruins trade of Ron Grahame to the Los Angeles Kings for a first round pick, that turned out to be eighth overall, enabled the Bruins to draft Ray Bourque, one of the greatest defensemen of all-time and the face of the Bruins for over two decades. The Bruins made the playoffs every year through the 1980s behind stars such as Park, Bourque and Rick Middleton—and had the league's best record in 1983 behind a Vezina Trophy–winning season from ex-Flyer goaltender Pete Peeters—but always fell short of making the Finals. Ray Bourque, shown in 1981 and before switching to his familiar No. 77, led the Bruins to two Stanley Cup Finals appearances in 1988 and 1990. Bourque, Cam Neely and Keith Crowder led the Bruins to another Cup Final appearance in 1988 against the Edmonton Oilers. The Bruins lost in a four-game sweep, but a memorable moment in the would-be fourth game ensued, when in the second period with the game tied 3–3, a blown fuse put the lights out at the Boston Garden. The rest of the game was cancelled and the series shifted to Edmonton. The Oilers completed the sweep, 6–3, back at Northlands Coliseum in Edmonton in what was originally scheduled as Game 5. The event is considered to be the reason the Bruins began work on a new arena. Boston returned to the Stanley Cup Final in 1990 (with Neely, Bourque, Craig Janney, Bobby Carpenter, and rookie Don Sweeney, and former Oiler goalie Andy Moog and Reggie Lemelin splitting goaltending duties), but again lost to the Oilers, this time in five games. In the 1987–88 NHL season – when the Bruins finally broke the Canadiens' 57-year-long (1930–87) playoff win streak against them – through the 1990, 1991, 1992 and 1994 seasons, the Bruins began to amass a playoff series winning streak of their own, in defeating their Original Six nemesis Montreal Canadiens in the playoffs, getting some revenge for a rivalry which had been lopsided in the Canadiens' favour in playoff action, with Montreal having won 18 consecutive playoff series against the Bruins between 1946 and 1987. In 1991 and 1992, the Bruins suffered two consecutive Conference Final losses to the eventual Cup champion, the Mario Lemieux-led Pittsburgh Penguins. Starting from the 1992–93 NHL season onwards, the Bruins had not gotten past the second round of the playoffs until winning the Stanley Cup after the 2011 season. The 1992–93 season ended disappointingly for several reasons. Despite finishing with the second-best regular season record after Pittsburgh, Boston was swept in the first-round by the Buffalo Sabres. During the post-season awards ceremony, Bruin players finished as runner-up on many of the honors—Bourque for the Norris, Oates for the Art Ross and Lady Byng Trophy, Joe Juneau (who had broken the NHL record for assists in a season by a left-winger, a mark he still holds) for the Calder Trophy, Dave Poulin for the Frank J. Selke Trophy, Moog for the William M. Jennings Trophy and coach Brian Sutter for the Jack Adams Award. Poulin did win the King Clancy Memorial Trophy, while Bourque made the NHL All-Star First Team and Juneau the NHL All-Rookie Team. The 1995 season would be the Bruins' last at the Boston Garden. The final official match played in the Garden was a 3–0 loss to the New Jersey Devils in the 1995 playoffs; the Bruins went on to play the final game at the old arena on September 28, 1995, in an exhibition matchup against the Canadiens. They subsequently moved into the FleetCenter, now known as the TD Garden. In the 1996 playoffs, the Bruins lost their first-round series to the Florida Panthers in five games. In 1997, Boston missed the playoffs for the first time in 30 years (and for the first time in the expansion era), having set the North American major professional record for most consecutive seasons in the playoffs. The Bruins lost in the first round of the 1998 playoffs to the Washington Capitals in six games. In 1999, the Bruins defeated the Carolina Hurricanes in six games during the first round of the playoffs. Nevertheless, they would lose to the Sabres in six games in the second round of the playoffs. In the 1999–2000 season, general manager Harry Sinden wanted Bourque to have a chance to close out his career with a Stanley Cup win and decided to pursue a trade with the Colorado Avalanche. Bourque and fellow veteran Dave Andreychuk were sent to Colorado in exchange for Brian Rolston, Martin Grenier, Samuel Påhlsson and a first-round draft pick (2000 draft, 27th overall, used to select Martin Samuelsson). In the 1999–2000 season, the Bruins finished in last place in the Northeast Division and failed to qualify for the playoffs. During a game between the Bruins and the Vancouver Canucks on February 21, 2000, Marty McSorley was ejected for using his stick to hit Canucks forward Donald Brashear in the head. McSorley was initially suspended for the remaining 23 games of the season. However, on October 6, McSorely was convicted of assault using a weapon for his attack on Brashear; he was then sentenced to 18 months of probation. As a result of the conviction, McSorley's suspension was extended through February 21, 2001. After a 3–4–1 start, the Bruins fired head coach Pat Burns and went with Mike Keenan for the rest of the way. Despite a 15-point improvement from the previous season, the Bruins missed the playoffs in 2000–01 by just one point, and Keenan was let go. Centerman Jason Allison led the Bruins in scoring. The following season, 2001–02, the Bruins improved again with another 13 points, winning their first Northeast Division title since 1993 with a core built around Joe Thornton, Sergei Samsonov, Brian Rolston, Bill Guerin, Mike Knuble and the newly acquired Glen Murray. Their regular season success did not translate to the post-season, however, as they lost in six games to the underdog eighth-place Montreal Canadiens in the first round. The 2002–03 season found the Bruins platooning their goaltending staff between Steve Shields and John Grahame for most of the season. A mid-season trade brought in veteran Jeff Hackett. In the midst of a late-season slump, general manager Mike O'Connell fired head coach Robbie Ftorek with nine games to go and named himself interim coach. The Bruins managed to finish seventh in the East, but lost to the eventual Stanley Cup champion New Jersey Devils in five games. In 2003–04, the Bruins began the season with ex-Toronto Maple Leaf goalie Felix Potvin. Later in the season, the Bruins put rookie Andrew Raycroft into the starting role. Raycroft eventually won the Calder Trophy that season. The Bruins went on to win another division title and appeared to get past the first round for the first time in five years with a 3–1 series lead on the rival Canadiens. However, the Canadiens rallied back to win three-straight games, upsetting the Bruins. The Bruins acquired Zdeno Chara on July 1, 2006, naming him the new team captain. The 2004–05 NHL season was wiped out by a lockout, and the Bruins had a lot of space within the new salary cap implemented for 2005–06. Bruins management eschewed younger free agents in favor of older veterans such as Alexei Zhamnov and Brian Leetch. The newcomers were oft-injured, and by the end of November, the Bruins team traded their captain and franchise player, Joe Thornton (who went on to win the Art Ross and Hart Trophies). In exchange, the Bruins received Marco Sturm, Brad Stuart and Wayne Primeau from the San Jose Sharks. After losing 10 of 11 games before the trade, the Bruins came back with a 3–0 victory over the league-leading Ottawa Senators, as rookie goaltender Hannu Toivonen earned his first career NHL shutout. When Toivonen went down with an injury in January, journeyman goalie Tim Thomas started 16-straight games and brought the Bruins back into the playoff run. Two points out of eighth place at the Winter Olympic break, the Bruins fired general manager Mike O'Connell in March and the Bruins missed the playoffs for the first time in five years. Peter Chiarelli was hired as the new general manager of the team. Head coach Mike Sullivan was fired and Dave Lewis, former coach of the Detroit Red Wings, was hired to replace him. The Bruins signed Zdeno Chara, one of the most coveted defensemen in the NHL and a former NHL All-Star, from the Ottawa Senators, and Marc Savard, who finished just three points short of a 100-point season in 2005–06 with the Atlanta Thrashers, to long-term deals. The 2006–07 season ended in the team finishing in last place in the division. The Bruins traded Brad Stuart and Wayne Primeau to the Calgary Flames for Andrew Ference and forward Chuck Kobasew. After the disappointing 2007 season, Lewis was fired as coach, and the Bruins announced on June 21, 2007, that former Canadiens and Devils head coach Claude Julien had been named as the new head coach. The Bruins also unveiled a new logo and a brand new shoulder patch closely based on the main jersey logo used until 1932. David Krejci during the 2007–08 season. Younger players on the Bruins roster, including Krejci, broke out during that season. The 2008 campaign saw the Bruins regain some respectability, finishing 41–29–12 and making the playoffs. The season ended on a bright note for the Bruins when they forced the Montreal Canadiens to play a seven-game playoff series, including a memorable Game 6 in which Boston came back to win 5–4. Their performance, despite a 5–0 loss in the seventh game, rekindled interest in the team in New England, where the Bruins had for years been heavily overshadowed by the Red Sox, Patriots and Celtics, all of whom had recently won championships in their respective leagues. Although Bruins center Patrice Bergeron was injured with a concussion most of the season, youngsters Milan Lucic, David Krejci, Vladimir Sobotka and Petteri Nokelainen showed promise in the playoffs. After a slow start to the 2008–09 season, the Bruins won 17 of their next 20 games, leading many to see them as a revival of the "Big Bad Bruins" from the 1970s and 1980s. During the 2009 All-Star Weekend's Skills Competition, captain Zdeno Chara fired the NHL's then-fastest measured "hardest shot" ever, with a clocked in speed of 105.4 mph (169.7 km/h) velocity. (Chara has since broken his own record three times, two of those on the same night.) The number of injured players in the season saw many call-ups from the Bruins' American Hockey League (AHL) Providence Bruins farm team, with rookie defenseman Matt Hunwick and forward Byron Bitz seeing success. The Bruins went on to have the best record in the Eastern Conference and qualified for the playoffs for the fifth time in nine years, facing the Canadiens in the playoffs for the fourth time during that span, defeating them in four games before losing in seven games to the Carolina Hurricanes in the conference semi-finals. The 2009 summer off-season saw the departure of long-time defensive forward P. J. Axelsson from Sweden, who signed a multi-year contract with his hometown Frölunda HC team. With Toronto Maple Leafs general manager Brian Burke threatening an offer sheet and Bruins management unable to meet his salary demands, forward Phil Kessel was traded to Toronto for a trio of future draft picks. The Bruins celebrate after winning the 2010 NHL Winter Classic. For the game, the Bruins hosted the Philadelphia Flyers at Fenway Park. On January 1, 2010, the Bruins won the 2010 NHL Winter Classic over the Philadelphia Flyers in a 2–1 overtime decision at Fenway Park, thus becoming the first home team to win an outdoor classic game. However, following the New Year's Day game, the Bruins, hobbled by injuries, would go through a five-week-long period of lackluster play, with only two wins and compiling ten regulation losses earning them only eight points in the Eastern Conference standings in that 15-game long period, before breaking the losing streak in an away game against the Canadiens on February 7, with Tuukka Rask shutting out the Habs 3–0. The win over the Canadiens was the first of four successive victories leading into the break in play for the NHL's participation in the 2010 Winter Olympics, and established Tuukka Rask as the number one goaltender for the Bruins, as Tim Thomas would only start 8 of the 22 games remaining in the post-Olympic period of the season, with Rask winning eight of his post-Olympic starts, including two shutouts. Thomas was on the silver medal-winning U.S. team, with Patrice Bergeron on the gold medal-winning Canadian team. The importance of former Buffalo Sabres forward Daniel Paille's acquisition by the Bruins, and his emergence as a penalty-killing forward, was emphasized on April 10, 2010, as Paille, Steve Begin and Blake Wheeler combined for the first-ever known trio of short handed goals within one penalty kill, in only 1:04 of game time, in a home game against the Carolina Hurricanes, helping the Bruins to sixth place in the NHL Eastern Conference, and a 2010 NHL playoff opening round appearance against the Buffalo Sabres, which they won 4–2. Boston became only the third team in NHL history to lose a playoff series after leading 3–0 when they lost in Game 7 to the Philadelphia Flyers after losing a 3–0 lead in the second round on May 14, 2010, also losing the services of Marco Sturm in the first game and playmaking center David Krejci to injury in the third game of the series. On April 13, 2010, the Boston Bruins received the second overall draft pick for the 2010 NHL Entry Draft, having received it via the trade that sent Phil Kessel to the Toronto Maple Leafs. With the pick, the Bruins selected Tyler Seguin on June 25, 2010. In other off-season moves, Greg Campbell and Nathan Horton joined the team, and Vladimir Sobotka and Dennis Wideman left the Bruins in the 2010 free agency. After the season ended on June 16, 2010, Cam Neely was named the new team president of the Bruins. On February 15, 2011, the Bruins acquired center Chris Kelly from the Ottawa Senators after Marc Savard's attempted comeback ended due to another concussion, this one delivered away at Colorado by former Bruin Matt Hunwick. Ottawa received the Bruins' second-round pick in 2011. Just two days later and on the brink of the trade deadline, the Bruins acquired defenseman Tomas Kaberle in a trade from the Toronto Maple Leafs in exchange for prospect Joe Colborne, a first-round selection in 2011 and a potential second-round pick in 2012 (which became official on May 27 when the Bruins clinched a berth in the Stanley Cup Finals). Mark Stuart and Blake Wheeler were also traded to the Atlanta Thrashers for Rich Peverley and Boris Valabik. Milan Lucic with the Stanley Cup after the Bruins defeated the Vancouver Canucks in Game 7 of the 2011 Stanley Cup Finals. In the 2011 Stanley Cup playoffs, the Bruins became the first team in NHL history to win a seven-game series without scoring a power-play goal, as they eliminated the Montreal Canadiens in seven games, and also won their first playoff series after trailing 2–0. On May 6, the Bruins swept the Philadelphia Flyers in four games to advance to the Eastern Conference Finals for the first time since 1992. Boston then defeated the Tampa Bay Lightning in seven games and advanced to the Stanley Cup Finals for the first time since 1990 to face the Vancouver Canucks. The Bruins lost the first two games of the series in very close contests, 1–0, on a goal with less than 19 seconds left in regulation, and then 3–2 in overtime. Game 3 did not start well for the Bruins either, as they lost Nathan Horton to injury at the 5:07 mark of the first period following a late hit by Canucks defenseman Aaron Rome that left Horton prone on the ice for nearly ten minutes. Despite losing Horton, the Bruins defeated the Canucks with four goals in each of the second and third periods, twice scoring short-handed goals, and going on to win, 8–1. It was the highest score by one team, and largest winning margin, in a Finals game since 1996. Game 4 saw the Bruins defeating the Canucks in a 4–0 shutout. The home team continued to be the winner, with Game 5 in Vancouver going to the Canucks in a 1–0 shutout, then Game 6 going to the Bruins, who staved off elimination with a 5–2 defeat of the Canucks. The Bruins set a new record for the quickest four goals ever in a playoff series game, scoring in only 4:14 of game time in the first period of Game 6. Game 7, which was played in Vancouver on June 15, was the first time the Bruins have ever played in Game 7 of the Stanley Cup Finals. The Bruins shut out Vancouver 4–0 after two goals each from Patrice Bergeron and Brad Marchand, winning the sixth Stanley Cup in franchise history and breaking a 39-year Cup drought. The 2010–11 Bruins were the first team in NHL history to win a Game 7 three times in the same playoff run. The championship also meant that all four Boston teams had won their respective championships at least once in the previous decade after the Red Sox won two World Series, the Patriots won three Super Bowls and the Celtics recaptured an NBA championship. Following the Stanley Cup Finals, Boston Globe columnist Dan Shaughnessy ranked all seven championships during the decade and ranked the Bruins' 2011 Stanley Cup triumph as third, behind only the Patriots winning Super Bowl XXXVI (second) and the Red Sox winning the 2004 World Series (first, breaking the "Curse of the Bambino"). Benoit Pouliot in a game with the Bruins during the 2011–12 season. The Bruins signed Pouliot to a one-year contract in July 2011. Following their Stanley Cup win, the Bruins lost Mark Recchi to retirement and Michael Ryder and Tomas Kaberle to free agency. The Bruins tweaked their roster by adding defenseman Joe Corvo and forward Benoit Pouliot. On October 6, 2011, prior their first home game of the 2011–12 season against Philadelphia, the Bruins raised their 2011 Stanley Cup Champions Banner to the roof at TD Garden. Members of the 1972 Championship Team, with Milt Schmidt and Bobby Orr leading the way, participated in the official Banner Raising Ceremony. The Bruins' short summer took its toll early, going 3–7–0 in the month of October, before responding with a 21–3–1 record to cap off 2011, highlighted by a near-perfect November in which the team did not lose in regulation. Sophomore forward Tyler Seguin shone the brightest during the streak, eventually paving the way for his first All-Star Game selection, joining teammates Zdeno Chara and Tim Thomas on Team Chara. On January 23, Thomas caused a stir by not attending the Bruins' visit to the White House, saying the government had "grown out of control". After an 8–4–1 record to begin 2012, the Bruins' inconsistent form resurfaced for much of February and March, during which they endured key injuries to Nathan Horton (concussion) and Tuukka Rask (groin), and an impotent power play. At the February 27 trading deadline, they traded for Greg Zanon, Mike Mottau and one-time Bruin Brian Rolston, then signed goalie Marty Turco to add goaltending depth. The Bruins went on to finish second in the Eastern Conference with 102 points, winning the Northeast Division title. They faced the Washington Capitals in the first round of the 2012 Stanley Cup playoffs. In a seven-game series in which all of the games were decided by only one goal, the Bruins came up short against rookie goalie Braden Holtby and head coach Dale Hunter's defensive-minded game plan. The seventh game saw Joel Ward deflect the series-winning goal past Tim Thomas in overtime to give the Capitals the victory and end the Bruins' season. During the off-season preceding the lockout, Tim Thomas made his decision to sit out the 2012–13 season. General manager Peter Chiarelli confirmed Thomas' decision. Thomas was first suspended for not reporting to training camp, then his rights were traded to the New York Islanders on February 7. The Bruins decided to go with the goaltending pair of Tuukka Rask and Anton Khudobin for the season. Meanwhile, highly touted prospect Dougie Hamilton was promoted to the main roster after spending a season in the juniors. The Bruins battled the Montreal Canadiens for leadership in the Northeast Division all season, before a loss to the Ottawa Senators in a make-up game following the Boston Marathon bombing on April 28 gave the Canadiens the division title. Boston settled for fourth place in the Eastern Conference standings with 62 points. On April 2, the Bruins acquired former All-Star Jaromir Jagr from the Dallas Stars, after failing to acquire Jarome Iginla from the Calgary Flames. Jagr would end up being a winger for the Patrice Bergeron–Brad Marchand forward line, as usual winger Tyler Seguin was transferred to the third line with Chris Kelly and Rich Peverley, to give a more even scoring threat across all four forward lines for the Bruins. The Bruins were the 2013 Eastern Conference champions, their second Conference title in three years. In the opening round of the 2013 playoffs, the Bruins took on the Toronto Maple Leafs. After leading the series 3–1 with a pair of wins in Toronto, the Maple Leafs won Games 5 and 6 to force Game 7 in Boston. Toronto led 4–1 in the third period of the decider, before the Bruins came back late with three goals. A goal from Nathan Horton 9:18 into the period cut the deficit to two, but the Bruins were unable to cut more into the lead until late in the period, when Milan Lucic and Patrice Bergeron scored at 18:38 and 19:09 respectively with the goalie pulled to tie the game at four. Bergeron would score again in overtime, netting the series winner to eliminate the Maple Leafs. Boston's Game 7 win marked the first time a team came back from a three-goal deficit in the third period to win a playoff game. In the second round, Boston led 3–0 against the New York Rangers before winning the series in five games. Boston then defeated the Pittsburgh Penguins in the Eastern Conference Finals in a four-game sweep to advance to the Stanley Cup Finals. In the Finals, they faced the Chicago Blackhawks. The Bruins fell in six games, with three going into overtime, including an epic Game 1 in which a third overtime period was needed before it was settled. The only game Boston lost by more than one goal was Game 5 in which Chicago scored on an empty net in the last 17 seconds. The 2013 Stanley Cup run by the Bruins was one that further united the New England region that had been rocked by tragedies, such as the Boston Marathon bombing and the Sandy Hook Elementary School shooting. Head coach Claude Julien said after the deciding Game 6, "You know, at the end of the day, I think that's what hurts the most is in the back of our minds, although we needed to focus on our team and doing what was going to be the best thing for our team to win a Stanley Cup, in the back of our minds we wanted to do it for those kind of reasons, the City of Boston, what Newtown has been through, that kind of stuff. It hit close to home, and the best way we felt we could try and cheer the area was to win a Stanley Cup. I think that's what's hard right now for the players. We had more reasons than just ourselves to win a Cup." In the 2013–14 season, the Bruins won the Presidents' Trophy after finishing first in the newly formed Atlantic Division with a record of 54–19–9 for 117 points. Their regular season success, however, would not translate into another Eastern Conference Finals appearance. Despite winning their first-round series against the Detroit Red Wings, the team fell to the Canadiens in seven games in the Eastern Conference Semi-finals during the 2014 playoffs. In the 2014–15 season, the Bruins finished with a record of 41–27–14 for 96 points, missing out on the playoffs by just two points after the Pittsburgh Penguins and the Ottawa Senators clinched the final two playoff spots in the East. The Bruins therefore became only the third team to miss the playoffs after winning the Presidents' Trophy in the previous season. The 96 points they earned that season broke the record for the most points earned by a team that did not make the playoffs. The Colorado Avalanche finished with 95 points in the 2006–07, which was the previous record. On April 15, 2015, Peter Chiarelli was fired by the Boston Bruins. On May 20, the Bruins named former player Don Sweeney as the team's new general manager for the 2015–16 season. One recent all-time franchise achievement the Bruins attained in the 2015–16 season is shared by only their greatest rival, the Canadiens – a total of 3,000 wins in the team's existence, achieved by the Bruins on January 8, 2016 in a 4–1 road victory against the New Jersey Devils. The team was seen as a playoff contender throughout the regular season. However, a sub-.500 record on home ice and frequent road losses in the final two months of the regular season resulted in a three-way battle for the final playoff spot in the East. The Bruins had a chance to clinch the final playoff berth with a win over the Ottawa Senators on the second-to-last day of the season, but they lost the game. That loss, combined with a Flyers' win over the Penguins, knocked the Bruins out of playoff contention in favor of the Flyers. For the first time since the two seasons following the 2004–05 lockout, the Bruins did not qualify for the playoffs in two consecutive seasons. Charlie McAvoy and other players warming up prior to a game in the 2017 Stanley Cup playoffs. The Bruins qualified for the Stanley Cup playoffs for the first time since 2014. During the second-to-last month of the 2016–17 regular season, the Bruins fired head coach Claude Julien and promoted Bruce Cassidy to interim coach. Cassidy's very slight changes in coaching to emphasize the players' speed and hockey skills, as opposed to Julien's, resulted in the Bruins achieving an 18–8–1 record through their remaining regular season games, finishing third in the Atlantic Division and qualifying for the playoffs for the first time since the 2013–14 season. In the first round of the playoffs, the Bruins lost to the Ottawa Senators in six games. Bruce Cassidy returned as head coach for the 2017–18 season, leading the Bruins to the playoffs for the second straight year. They had a record of 50–20–12, including an 18-game point streak, which lasted from December 14, 2017, to January 25, 2018. They finished one point behind the Tampa Bay Lightning for the top spot in the Atlantic Division. They defeated the Toronto Maple Leafs in round one, 4–3, but ultimately lost to the Lightning in round two, 4–1. The season saw young players perform well, including Jake DeBrusk, Danton Heinen, Ryan Donato, and Charlie McAvoy. The Bruins also acquired veterans Rick Nash, Nick Holden, Brian Gionta, and Tommy Wingels through trades or through free agent signings. Team founder Charles Adams owned the team until 1936, when he transferred his stock to son Weston Adams, general manager and minority owner Art Ross and minority owner Ralph Burkard. Weston Adams remained majority owner until 1951, when the Boston Garden-Arena Corporation purchased controlling interest in the team. Under the Garden-Arena Corporation's management, Boston Celtics founder Walter A. Brown ran the team from 1951 until his death in 1964. After Brown's death, Weston Adams returned to the role of team president. In 1969, he was succeeded by his son, Weston Adams, Jr.
Former Bruins winger and current president Cam Neely, and owner Jeremy Jacobs. On December 7, 1973, Storer Broadcasting, owner of WSBK-TV, and the Garden-Arena Corporation agreed to a merger which resulted in Storer acquiring a 100% interest in the Bruins. Adams remained as team president. In August 1975, Storer Broadcasting then sold the team to an ownership group headed by Jeremy Jacobs. Jacobs had to promise to keep Bobby Orr as a condition of the purchase. The Bruins and Orr reached a verbal agreement with Jacobs during the summer of 1975, including a controversial agreement for Orr to take an 18.5% share of the Bruins after his playing days were over. The agreement was to be checked out as to whether it would be legal for tax reasons and whether or not the League would approve it. However, Orr's agent, the later-notorious Alan Eagleson, rejected the deal. Jacobs represents the club on the NHL's Board of Governors, and serves on its Executive Committee, and he has chaired the Finance Committee. At the NHL Board of Governors meeting in June 2007, Jacobs was elected chairman of the Board, replacing the Calgary Flames' Harley Hotchkiss, who stepped down after 12 years in the position. Jacobs has frequently been listed by the Sports Business Journal as one of the most influential people in sports in its annual poll and by Hockey News. His company owns TD Garden and he is partners with John Henry, owner of Major League Baseball's Boston Red Sox, in the New England Sports Network (NESN). After taking over as owner in 1975, the Bruins have been competitive (making the playoffs for 29-straight seasons from 1967–68 to 1995–96, 20 of which were with Jacobs as owner) but have won the Stanley Cup only once, in 2011 and only in his 36th year as owner. Under previous ownerships, the Bruins had won the Stanley Cup five times. Under Jacobs, the Bruins have reached the Stanley Cup Final six times (twice against the Bruins' arch-rival Montreal Canadiens in 1977 and 1978, twice against the Edmonton Oilers in 1988 and 1990, finally winning in 2011 against the Vancouver Canucks, and losing in 2013 to the Chicago Blackhawks). Jacobs' management of the team in the past earned him spots on ESPN.com's "Page 2" polls of "The Worst Owners in Sports," and number 7 on their 2005 "Greediest Owners in sports" list. Sports Illustrated has suggested longtime star defenseman Ray Bourque, who "often drawn the ire of the NHLPA for his willingness to re-sign with Boston with minimal negotiations over the years" instead of setting the "watermark for defenseman salaries", requested and received a trade in 2000 since the team's "hardline and spendthrift ways" meant he would have to make the move to get his elusive Stanley Cup (Bourque holds the record for most games played before winning the Cup). Prior to the NHL Collective Bargaining Agreement signed in 2005, fans felt team management was not willing to spend to win the Stanley Cup. The Bruins previously trained and practiced at the Bright-Landry Hockey Center in Allston, Massachusetts (built in 1956), then moved to the Ristuccia Ice Arena in Wilmington, Massachusetts, itself completed in 1986, before the quite recent completion of the new Warrior Ice Arena in the Brighton neighborhood of Boston, where they are currently training. Blades the Bruin serves as the official mascot for the Boston Bruins. Blades the Bruin is an anthropomorphic bear serves as the Bruins' team mascot. In January and February, Blades travels around the greater Boston area to raise money for the Bruins Foundation. For a sizable amount of the team's more recent TV and online ads, a different anthropomorphic ursine character simply known as "The Bear" appears in official Bruins video advertising. When Boston television station WSBK-TV began broadcasting Bruins games in 1967, the producers of the games' telecasts wanted a suitable piece of music to air for the introduction of each game. Perhaps inspired by the Boston Ballet's annual Christmas performance of The Nutcracker had become closely identified with Boston, The Ventures' instrumental rock version of the Nutcracker's overture, known as "Nutty", itself thought to be that group's version of the slightly earlier hit "Nut Rocker", was selected as the opening piece of music for Bruins telecasts. The song "Nutty" has been identified with the Bruins ever since, and is still sometimes played at the TD Garden during Bruins games. On ice, "Paree", a 1920s hit tune written by Leo Robin and Jose Padilla, has been played as an organ instrumental for decades, typically as the players entered the arena just before the start of each period and, for many years, after each Bruins' goal. It was introduced by John Kiley, the organist for the Bruins from the 1950s through the 1980s, and is still played during Bruins' games. "Kernkraft 400 (Sport Chant Stadium Remix)" by Zombie Nation has been played for a number of seasons now after every Bruins goal scored on home ice, after two short blasts of a Kahlenberg KM-135 replica boat horn. As an "influence" from its use by the Bruins, the Zombie Nation number has also been used by the Red Sox following a Sox batter's home run at Fenway Park during their most recent MLB season. The Patriots use the Bruins recording of the horn for every third down at Gillette Stadium. Prior to 2007, the team used an actual horn in the then Fleet Center that sounded exactly the same as the MBTA Orange Line train. but the horn was positioned awkwardly up into the arena, when the Bruins scored, the horn was almost unrecognizable. By 2007, they used a recording of the horn. Records show that the real model horn was bought by the Bruins, but was never installed. From 1970 until 1995 in the old Boston Garden, the team used "The Nutcracker" also known as "Nutty" as a goal song. From 1995 to 1999 when the song was used after goals, the team used an organ version of "Paree" by organist John Kiley followed by "Rock and Roll Part 2". From 1999 to 2006, the team used "Song 2" by Blur as the goal horn. Currently "Cochise" by Audioslave is played whenever the Bruins enter the ice. "Joker and the Thief" by Wolfmother is played before the opening faceoff. Conversely, after every Bruins' win at the TD Garden (as with the NESN-covered Boston Red Sox when winning a baseball game at Fenway Park), "Dirty Water", by The Standells, is played. During the month of December, the team uses "The Nutcracker", a traditional song with the Bruins. Quincy punk rock band Dropkick Murphys wrote their song "Time to Go" (released in their 2003 album Blackout) as a Bruins rally tune, and has performed their own version of The Ventures' song "Nutty" at games. Although it did not come with the band's guarantee to help bring home a championship, as they did with their song "Tessie" for the Red Sox, it is still a part of the team's culture and is played during third period TV timeouts. Two other Dropkick Murphys songs which are sometimes played at the TD Garden to rally the home crowd are "I'm Shipping Up to Boston" and "The Boys Are Back." The current head coach is Bruce Cassidy, who was promoted on an interim basis to the head coaching position on February 7, 2017, after Claude Julien was fired, and was named head coach permanently on April 26. He previously served as the assistant coach for the Bruins and was the head coach for the Bruins' AHL affiliate, the Providence Bruins. Following the team's failure to make the 2015 playoffs, Peter Chiarelli was fired as general manager on April 15, 2015, with Don Sweeney hired as Chiarelli's replacement on May 20, 2015. Banners of the Bruins' retired numbers hang at the Garden. 1 Hitchman was the first player to have his number retired by the Bruins, and the second in both the NHL, and in all of North American professional sports. The Bruins are the only Original Six team not to have retired uniform number 1. The Boston Bruins presently acknowledge an affiliation with a number of inductees to the Hockey Hall of Fame. Inductees affiliated with the Bruins include 51 former players and seven builders of the sport. The six individuals recognized as builders by the Hall of Fame includes former Bruins executives, general managers, head coaches, and owners. In addition to players and builders, two broadcasters for the Bruins were also awarded the Foster Hewitt Memorial Award from the Hockey Hall of Fame. In 1984, Fred Cusick, a play-by-play announcer, was awarded the Hall of Fame's inaugural Foster Hewitt Memorial Award. In 1987, Bob Wilson became the second Bruins' broadcaster to be awarded the Foster Hewitt Memorial Award. Recording 793 points as a Bruin, Wayne Cashman is the seventh highest point leader in the franchise. The Bruins have several team awards that are traditionally awarded at the last home game of the regular season. Phil Esposito holds the franchise record for most goals in a season (76) and most points in a season (152). Rene Rancourt, former singer of the national anthem for most Bruins home games. ^ Art Ross was the Bruins' first head coach and general manager. He was inducted in the players' category in 1945. Although Ross never played with the Bruins, and was not formally inducted in the builders category, the team continues to acknowledge an affiliation with the Hall of Famer. ^ "Club Directory". BostonBruins.com. NHL Enterprises, LP. Retrieved February 19, 2017. ^ Russo, Eric (June 21, 2017). "The Evolution of the Boston Bruins Sweaters". BostonBruins.com. NHL Enterprises, LP. Retrieved December 9, 2017. When the Bruins take the ice this fall they'll be doing so with a bit of a different look – although one only the savviest of fans may recognize. On Tuesday night, the National Hockey League and adidas debuted their partnership by unveiling the league's new ADIZERO jerseys in Las Vegas. The Black & Gold's new threads contain only subtle variations from the sweaters they have worn since 2007, when Reebok took over the NHL's uniform design. ^ Katy Fitzpatrick (October 2, 2009). ""New Season Brings Renovated Arena for Northeastern," USCHO.com, October 2, 2009". Uscho.com. Archived from the original on January 9, 2010. Retrieved March 18, 2011. ^ Marrazza, Dan (June 14, 2016). "How NHL Teams Got Their Names". National Hockey League. Retrieved January 18, 2018. ^ Pelletier, Joseph (June 2011). "Joe Pelletier's Greatest Hockey Legends.com – Smokey Harris". bruinslegends.blogspot.com. bruinslegends.blogspot.com. Retrieved November 24, 2016. This is Smokey Harris. He is the answer to the trivia question "Who scored the first goal in Boston Bruins history? "...on December 1st, 1924 the Bruins played their first NHL game, hosting their expansion cousins the Montreal Maroons at the Boston Arena. The Maroons opened the scoring that night, with Dinny Dinsmore scoring on an unassisted effort at the 9-minute mark of the 1st period. Cue Harris. At 3:30 of the second period he took a pass from Carson "Shovel Shot" Cooper and beat Maroons goaltender Clint Benedict to open the scoring. Exactly 6 minutes later Cooper scored the only other goal of the night, securing the Bruins a 2–1 victory in their very first game. ^ "Canadiens Downed Boston, Rallying in Final Period". The Gazette. Montreal. The Canadian Press. December 9, 1924. p. 16. Retrieved June 12, 2017. The world champion Canadiens defeated Boston in a fast game here tonight, 4–3, incidentally giving 5,000 Boston hockey fans the best exhibition of the Canadian game on record here. ^ "NHL hockey came to the U.S. on Dec. 1, 1924". National Hockey League. Retrieved November 2, 2017. ^ "Boston Bruins Anniversary Logo – National Hockey League (NHL) – Chris Creamer's Sports Logos Page – SportsLogos.Net". SportsLogos.net. Retrieved November 2, 2017. ^ "Noel Picard". Hockey Hall of Fame. Retrieved March 12, 2012. ^ Dryden 2000, p. 75. ^ Brunt 2006, pp. 53–254. ^ "CNNSI.com – NHL Hockey – Say It Ain't So: Los Angeles Kings – Tuesday February 27, 2001 06:14 PM". CNN. Retrieved April 26, 2010. ^ "Galleries". CNN. December 6, 1976. ^ "CNNSI.com – NHL Hockey – Say It Ain't So: Los Angeles Kings – Tuesday February 27, 2001 06:14 PM". CNN. ^ "Devilish Feat by the Bruins". CNN. May 23, 1988. Retrieved April 26, 2010. ^ "Boston Bruins Name Claude Julien Head Coach" Archived July 16, 2007, at the Wayback Machine, Bruins website, June 21, 2007. ^ Edelson, Kevin. "Dressed for Success?" Archived January 12, 2009, at the Wayback Machine, New England Hockey Journal, June 21, 2007. ^ "Bish's Blog: Thank You P.J." National Hockey League. Retrieved November 2, 2017. ^ Boston Bruins website "Cam Neely Named President of the Boston Bruins", June 16, 2010. ^ Shaughnessy, Dan (June 17, 2011). "How great is this?". Boston Globe. p. C1. Archived from the original on April 6, 2012. Retrieved June 29, 2011. ^ Morreale, Mike G. (January 8, 2016). "Bruins defeat Devils for 3,000th win in history". National Hockey League. Retrieved January 9, 2016. Center Ryan Spooner and defenseman Colin Miller each had a goal and an assist to help the Boston Bruins become the second team in NHL history to win 3,000 regular season games with a 4–1 win against the New Jersey Devils at Prudential Center on Friday. ^ Reissis, Alexandros (June 15, 2017). "Boston Bruins: Why the Atlantic Division is there for the taking". yardbarker.com. Yardbarker. Retrieved June 24, 2017. With the 2016–2017 NHL season finished, it is time to look ahead to next season...The Boston Bruins, who made the playoffs for the first time since 2014, will look to take another step forward under head coach Bruce Cassidy. Cassidy, who replaced Claude Julien, turned the Bruins into a team that used speed and skill, and it worked. Even though the B's lost in Round 1 against the Ottawa Senators in six games, this season was a sign of great things to come. ^ "Bruins extend point streak to 18 with win over Senators, 3–2". nbcsports.com. NBC Sports. January 25, 2018. Retrieved May 12, 2018. OTTAWA, Ontario – Jake DeBrusk wasn't even trying to score and ended up with the winner. DeBrusk beat Mike Condon with 8:41 left to lift the Boston Bruins over the Ottawa Senators 3–2 on Thursday night for their fifth straight win. ^ "Boston Bruins in New Hands". The Boston Daily Globe. October 10, 1936. ^ "Boston Bruins Change Hands". Associated Press. October 12, 1951. Retrieved March 19, 2012. ^ "Adams after Adams as Bruins president". United Press International. April 1, 1969. Retrieved March 17, 2012. ^ "Storer Denies it Will Dump Bruins Prexy". Associated Press. February 14, 1973. Retrieved March 17, 2012. ^ Brunt 2006, pp. 261–262. ^ Brunt 2006, p. 262. ^ "Jeremy Jacobs – Greater Buffalo Sports Hall of Fame". Retrieved February 24, 2019. ^ "The Worst Owners in Sports". ^ "The Greediest Owners in Sports". ^ "CNNSI.com – NHL Hockey – Say It Ain't So: Boston Bruins – Wednesday May 09, 2001 05:36 PM". CNN. ^ "NHL Team Valuations". Forbes. Archived from the original on March 17, 2011. ^ a b "Bruins Relieve Claude Julien of Coaching Duties". National Hockey League. February 7, 2017. Retrieved February 7, 2017. ^ a b "Bruce Cassidy Named 28th Head Coach of the Boston Bruins". National Hockey League. April 26, 2017. Retrieved April 26, 2017. ^ "Neely to be named Bruins president". ^ "Ristuccia arena". ristucciaarena.com. Retrieved November 2, 2017. ^ "Boston Bruins:Team Mascot". Retrieved June 30, 2013. ^ "BostonBruinsTV – The Bear". bostonbruins.com. Boston Bruins. Retrieved April 12, 2014. ^ Nichols, John (2008). The Story of the Boston Bruins. Creative Education. ISBN 1-58341-614-5. ^ Fischler, Stan (2000). Boston Bruins: Greatest Moments and Players. Sports Publishing, Inc. p. 237. ISBN 1-58261-213-7. Retrieved November 6, 2016. ^ "Sprague Cleghorn selected as coach of Boston Bruins". The Gazette. Montreal. November 3, 1927. Retrieved November 2, 2017 – via Google News Archive Search. ^ "Cassidy, Pandolfo To Join Bruins Coaching Staff; Whissel Named Bruins Director of Sports Performance And Rehab". National Hockey League. May 24, 2016. Retrieved February 7, 2017. ^ "Cam Neely Named President of the Boston Bruins". National Hockey League. Retrieved November 2, 2017. ^ "Legends of Hockey – Spotlight – One on One with Ace Bailey". hhof.com. Retrieved November 2, 2017. ^ a b c d "A Look at the Bruins in the Hockey Hall of Fame". Boston Bruins. June 29, 2017. Retrieved April 12, 2018. ^ "Bruins Select Defenseman Urho Vaakanainen in 1st Round of 2017 NHL Draft". nhl.com/bruins. Boston Bruins. June 23, 2017. Retrieved June 24, 2017. Boston Bruins General Manager Don Sweeney announced today, June 23, that the Boston Bruins have selected defenseman Urho Vaakanainen in the first round (18th overall) of the 2017 NHL Entry Draft. Donovan, Michael Leo (1997). The Name Game: Football, Baseball, Hockey & Basketball How Your Favorite Sports Teams Were Named. Toronto: Warwick Publishing. ISBN 1-895629-74-8. The 2007–08 Boston Bruins season began on October 5, 2007. It was their 84th season in the National Hockey League. The Boston Bruins Radio Network is a 18-station (9 AM, 9 FM, plus 3 FM translators) network which carries live game broadcasts of the Boston Bruins. The network's flagship station is WBZ-FM/98.5-Boston, Massachusetts. Judd Sirott announces play-by-play. Bob Beers provides color commentary. Bradley Kevin Marchand (born May 11, 1988) is a Canadian professional ice hockey player, currently playing left wing for the Boston Bruins of the National Hockey League (NHL). Marchand was selected by the Bruins in the third round, 71st overall, at the 2006 NHL Entry Draft. During his time with Boston, he has won the Stanley Cup in 2011 and was named to the 2017 and 2018 NHL All-Star Game. Marchand played major junior hockey in the Quebec Major Junior Hockey League (QMJHL) prior to his NHL career. Donald Clarke Sweeney (born August 17, 1966) is a Canadian former ice hockey defenceman who played over 1,100 games in the National Hockey League (NHL), mostly with the Boston Bruins. He ranks among the top ten in many Bruins team statistics, including third overall in total games played. After retiring from hockey following the 2003–04 season, he worked briefly as a broadcaster before rejoining the Bruins as a team executive in 2006. He is the current general manager of the Bruins, a position he has held since May 2015 after replacing Peter Chiarelli. Gerald Michael "Cheesey" Cheevers (born 7 December 1940) is a former goaltender who played in the National Hockey League and World Hockey Association between 1961 and 1980. He is best known for his two stints with the Boston Bruins, whom he helped win the Stanley Cup in 1970 and 1972. He was inducted into the Hockey Hall of Fame in 1985. The Boston Bruins, a professional ice hockey team based in Boston, Massachusetts, has had eight general managers in its team history. The franchise is a member of the Atlantic Division of the Eastern Conference of the National Hockey League (NHL). The franchise was founded in 1924 and entered the NHL as the first American-based expansion team, playing its initial seasons at the still-active Boston Arena. It is an Original Six team, along with the Toronto Maple Leafs, Detroit Red Wings, New York Rangers, Montreal Canadiens and Chicago Blackhawks. Its home arena is the 17,565-person capacity TD Garden, where it has played since 1995, after leaving the Boston Garden. The Boston Bruins, a professional ice hockey team based in Boston, Massachusetts, has had 27 head coaches in its team history. The franchise is a member of the Atlantic Division of the Eastern Conference of the National Hockey League (NHL). The franchise was founded in 1924 and entered the NHL as the first American-based expansion team, playing its initial seasons at the still-active Boston Arena. It is an Original Six team, along with the Toronto Maple Leafs, Detroit Red Wings, New York Rangers, Montreal Canadiens and Chicago Blackhawks. Its home arena is the 17,565-person capacity TD Garden, where it has played since 1995, after leaving the Boston Garden.Art Ross served four terms as the Bruins head coach. Ross, Cy Denneny, Lynn Patrick, and Milt Schmidt have all been inducted to the Hockey Hall of Fame. Harry Sinden, Gerry Cheevers, Tom Johnson and Frank Patrick are Hockey Hall of Fame inductees, and spent their entire coaching careers with the Bruins. Cooney Weiland, Dit Clapper, Terry O'Reilly, Steve Kasper and Mike O'Connell also coached only for the Bruins, with Mike Sullivan taking over as head coach for the Pittsburgh Penguins on December 12, 2015.Statistically, Tom Johnson was the best coach, with a winning percentage of .738. He is followed by Harry Sinden, who, averaging his two terms, had a winning percentage of .689. The worst coach statistically was Phil Watson, who, with a winning percentage of .268, only won 16 out of the 84 games he coached. Claude Julien, the previous coach of the Bruins, took over after Dave Lewis was dismissed in 2007.Bruce Cassidy was named interim head coach on February 7, 2017 following the firing of Julien. Cassidy has since been named permanent head coach. Michael Milbury (born June 17, 1952) is an American former professional ice hockey player currently working as an analyst for the NHL on NBC. He played for twelve seasons in the National Hockey League (NHL), all of them for the Boston Bruins. He later served as assistant general manager under Harry Sinden and head coach for Boston, as well as general manager and head coach for the New York Islanders. Patrice Bergeron-Cleary (born July 24, 1985) is a Canadian professional ice hockey centre and alternate captain for the Boston Bruins of the National Hockey League (NHL). Bergeron played junior hockey with the Acadie–Bathurst Titan of the Quebec Major Junior Hockey League (QMJHL) for one full season before being selected 45th overall by the Bruins in the 2003 NHL Entry Draft. He made the immediate jump from junior to the NHL after his draft and joined the Bruins in the 2003–04 season. Internationally, Bergeron competes for Canada and has won gold medals at the 2004 World Championships, 2005 World Junior Championships, 2010 Winter Olympics, and 2014 Winter Olympics. Bergeron is a member of the Triple Gold Club after winning the Stanley Cup with Boston on June 15, 2011. He scored two goals including the Stanley Cup winning goal at 14:37 of the first period of Game 7 away against the Vancouver Canucks. For his superb two-way playing abilities, he has earned four wins of the Frank J. Selke Trophy awarded annually to the NHL forward with the best defensive skills, tying him with Bob Gainey for the most wins of the trophy in NHL history. Bergeron is one of the premier two-way forwards in the game today. Raymond Jean Bourque (born December 28, 1960) is a Canadian former professional ice hockey player. He currently holds records for most career goals, assists, and points by a defenceman in the National Hockey League (NHL). He won the James Norris Memorial Trophy as the NHL's best defensemen five times, while finishing second for that trophy a further six times. He also twice finished second in the voting for the Hart Memorial Trophy, a rarity for a defenceman. He was named to the end-of-season All-Star teams 19 times, 13 on the first-team and six on the second-team. Bourque was also an Olympian with Canada and became nearly synonymous with the Boston Bruins franchise, for which he played 21 seasons and became Boston's longest-serving captain. Bourque finished his career with the Colorado Avalanche, with whom he won his only Stanley Cup in his final NHL game. In 2017, he was named one of the 100 Greatest NHL Players. Tyler Paul Seguin (born January 31, 1992) is a Canadian professional ice hockey centre, currently an alternate captain for the Dallas Stars of the National Hockey League (NHL). Seguin was selected second overall in the 2010 NHL Entry Draft by the Boston Bruins and went on to win the 2011 Stanley Cup in his rookie season. He finished the 2011–12 season in Boston with a plus-minus of +34, the second highest in the NHL. During the 2012–13 NHL lockout, Seguin played for EHC Biel of the Swiss National League A (NLA) and finished the season with 25 goals, the most on the team. In 2013, Seguin played in his second Stanley Cup Finals in three seasons, ultimately losing the series to the Chicago Blackhawks. On July 4, 2013, Seguin was traded by the Bruins to the Dallas Stars for a package of players including Loui Eriksson.